Freight train smashes utility truck "video"
Location: So Cal the welfare state! Actually, you don’t share the road with trains—you stop and let them have the right of-way. You must ALWAYS yield to trains. A train collision is always the fault of the car driver. Nearly half the car/train collisions in America happen at crossroads with lights, bells, or gates; and two-thirds of the crashes happen in full daylight. Some people just don't get this. So the idiot driver said he didn't see the train? Apparently he wasn't looking at the crossing lights either. Very lucky to be alive. Not so lucky to be so stupid. It's a helpless feeling sitting in that seat, knowing you're about to clobber someone. All you can do is dump the air and hope. I'll toss this out and maybe it will stick in a few minds. You know how when you're driving, and either you or the other driver might screw up. One car dives on the brakes, and thereby just avoids a collision. Well, because trains are so big and massive, and the way things in the brake system work, it takes several seconds or even longer, after the engineer applies the brakes in emergency "mode", before the train even STARTS to slow down at all. So - except for maybe a locomotive traveling all by itself at very slow speed - there is NOTHING that engineer can do to help you out. By the time he determines that a crash is going to happen, it's totally out of his hands. Years back I was involved in two deliberately staged crossing collisions which were used as a drill for first responders, and to make video for educational purposes. When I showed those tapes at a safety booth at fairs etc, that was something I always pointed out to people. They could hear the air blast when I applied the brakes well BEFORE the impact, but the in-cab camera clearly showed we were still going just as fast even after the hit. Moral of the story - take railroad crossings seriously. There often is no second chance. What are you, the railroadman or something?? Good points and crazy video. Nothing like calling the boss to tell him your destroyed the company truck today. Not any more, 44 years was enough! It stays with you though. Especially if you have a bad one. I was fortunate that I DIDN'T have a bad one - the worst injury in any of the ones I was in was some minor cuts to the motorist's head. My uncle as an engineer wasn't quite as lucky........neither was the operator of the vehicle. The incident has never left him. Even though there was nothing he could do, as you explained. Driving around in a warehouse district in Durham NC many years ago I was approaching a RR crossing with a simple crossed arm marking---no lights, no bells, no gate---and was quite surprised to have a train come out from between two buildings & cross the road in front of me. 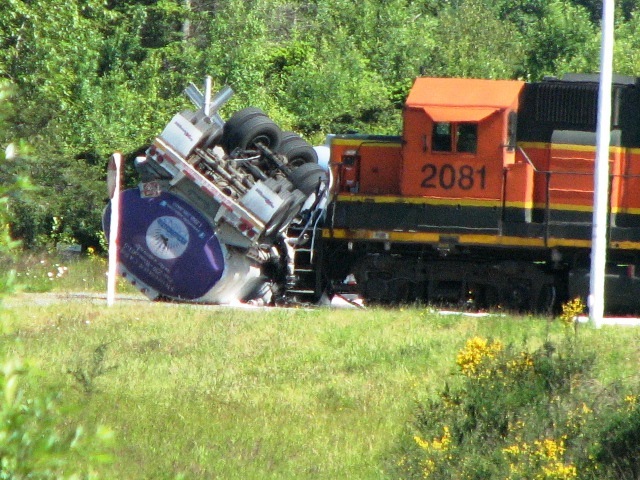 There was no way to see it coming, just suddenly there was a huge train on a collision course 30-40 feet away!!! Stopped in time, of course, and have been extra carefull at RR crossings ever since. That "X" crossbuck sign - even without any lights or gates - is the same thing as a "yield". I read of a tragedy that happened years ago, Engineer was doing everything by the book, making about 60MPH. Car came to a crossing, he could see as if it was slow motion - the guy driving looking ahead, the woman in the passenger seat suddenly pointing and hollering - and a little kid in the back smiling and waving at him. Killed all three of them. He said every day of his life he sees that little kid in his mind, and thinks that if he had stopped to tie his shoe, or had waited an extra 2 seconds to throttle up when he started out, or anything else. It's sad for those who died, and also sad for the guy who feels like he is somehow at fault even though he was not. It's crazy how many people just don't care about train safety. It's pretty simple, the train can only move on tracks, it just doesn't come out of no where. When you cross over tracks, you are on the trains territory and need to be smart and careful. Cell phone conversations and texting are only going to make this more prevalent. It is noted that this incident took place in Wellington, Utah. Clearly, both the driver and passenger of the utility truck as well as the train’s engineer were returning from their trek to utah997's Halloween bonanza, where they had overdosed on Krispy Kremes. They were all still hopped up on a sugar-rush and lost focus. Either utah997 or Krispy Kremes should be banned from O/T. Where the heck is the dude who just passed his bar exams, "I dream of vettes", when you need a lawyer?! Somewhere I read people commit suicide by walking out on the RR tracks. That just has to be horrible for the train operators. Outside of the immense weight and momentum of a moving train, engines are also built to be extremely tough on their ends. First of all, you've got the 1/4 inch thick steel plow at the very front. 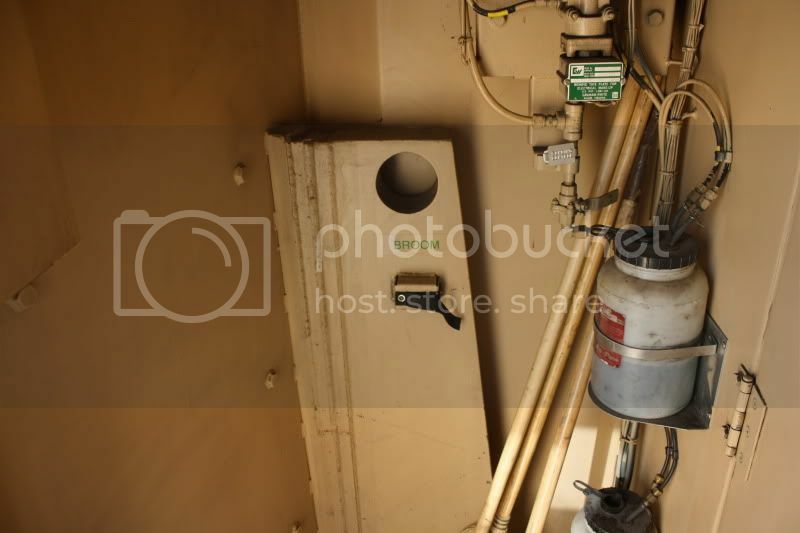 Behind that, you've got an inch thick plate of steel that extends from the bottom of the deck to the bottom step. There is a similar plate on the other side of the steps. The entire front of the cab is 1/4 inch steel with at least four collision posts inside. These posts are designed to deflect the object of collisions up and over the cab of the engine. As you can see, these posts are huge. Compare the damage. Don't mess with a train. My brother is a engineer for the railroad and he has told me that people in all kinds cars and trucks take chances with trains. He said he has even seen school buses trying to beat a train. Hit a garbage truck in Sanford NC. I remember how odd to see such a massive thing on its' side, spinning like a top. No serious injuries. Quick Reply: Freight train smashes utility truck "video"